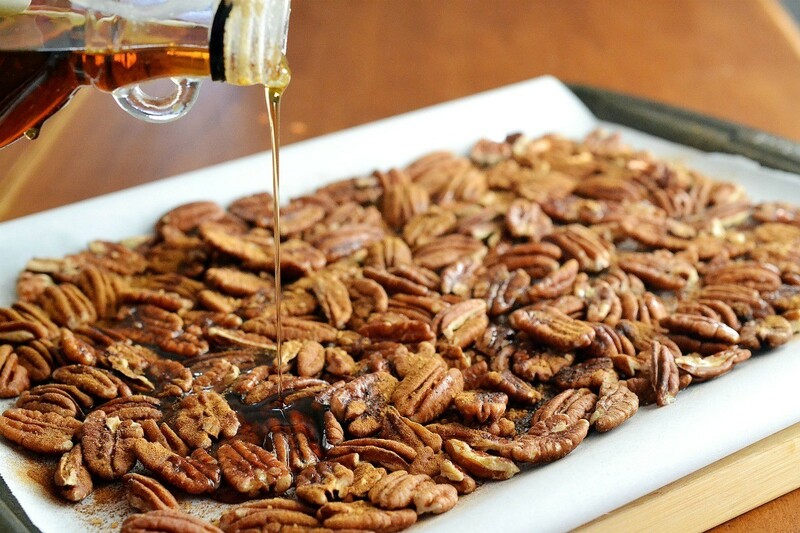 This is a guide about spiced pecans. Spiced pecans offer the perfect balance of spicy and sweet. If you haven't had this variety, here are some recipes to try. Melt butter and add seasonings. Mix thoroughly. Add pecans and toss gently until all nuts are coated. Place in shallow baking pan. Bake at 300 degrees F for 30 minutes. Turn at least once. My husband just purchased several bags of pecans from one of the ladies in his office. Her grandpa shells and packages them, so he could not say no. Here is a great tip for yummy nuts to use as a gift or to enjoy yourself. The holidays are fast approaching so I pulled out my recipes for snacks and found just the one needed to use on the pecans. I then plan to freeze them until I will need a hostess gift or a thank you gift. Even if you do not get as good a deal as my husband did on the pecans, watch your local grocery ads as nuts go on sale often this time of year. I have only made these with pecans, but you could use walnuts or natural almonds, or a mixture of the three. Preheat your oven to 325 degrees F. Spray your baking sheets with a non cook spray or grease your pans lightly with margarine. In a bowl, mix the spices and the sugar. In a good size bowl, beat the egg white until foamy, then stir your nuts into the foamy egg white. Add your spice and sugar mixture. Mix well until nuts are coated. Spread your nuts evenly between the two pans and bake 25 minutes or until they look a nice brown to you. Take them out of the oven and stir them a couple times during your baking time, so they will brown evenly. When nicely browned, let cool completely before freezing or putting into container to give away. You can put them in any simple container you have like a vase, cup or mug, wrap in cellophane or wrapping tissue paper and add a ribbon. This makes a great snack for a time you have people over. A neighbor gave me this recipe when we were at a open house she had and served these nuts. This is a great time of year to find spices on sale too. I the ones I needed this morning on sale at Krogers, their brand of spices. Enjoy! Toss pecans in butter.combine remaining ingredients. 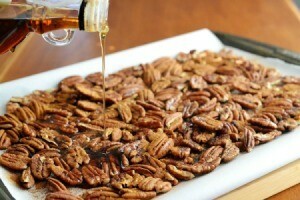 Sprinkle this over pecans, tossing to coat. Spread on a cookie sheet. Bake at 325 degrees F for 15 minute; stirring occasionally. Cool. Eat and enjoy as they do not last long.